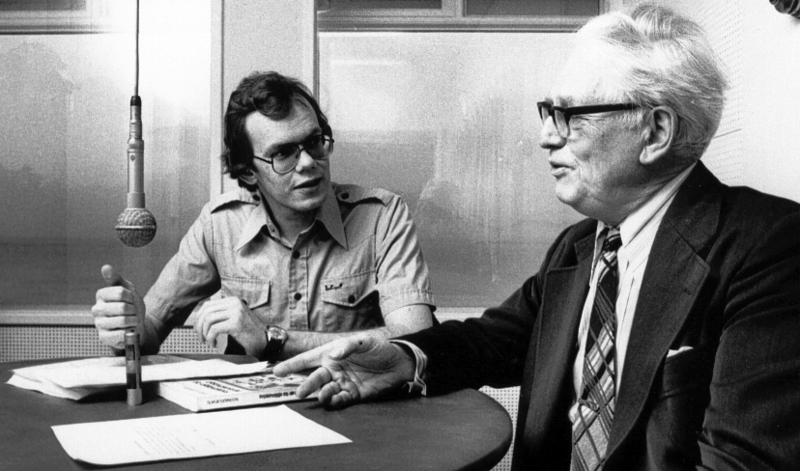 Hannes H. Gissurarson interviews Olafur Bjornsson for radio 12 November 1978. The old and venerable magazine Andvari each year publishes a short biography of a leading Icelander. In 2016, RNH Academic Director Hannes H. Gissurarson writes a 63 pages article about the leading free market economist Professor Olafur Bjornsson. It starts with Bjornsson’s forefathers and his studies at Akureyri Grammar School and Copenhagen University where Bjornsson was an outstanding student. Professor Gissurarson mentions Bjornsson’s interest in radical political ideas while in Copenhagen and his participation in Kyndill, an association of radical Icelandic students in Copenhagen. After reading works by von Mises and Hayek, Bjornsson turned away from socialism. He became convinced that the most efficient way of ordering economic production was by devolution of power and free international trade. Under central economic planning the knowledge and skills of individual participants in the market process were not fully utilised. When Bjornsson returned to Iceland in 1938, he therefore became one of the strongest critics of the extensive economic controls in Iceland which had been adopted in the World Depression. In 1944, he also translated an extract of Hayek’s Road to Serfdom, which led to a heated debate in Icelandic newspapers, the communist newspaper calling Hayek “the international freak” and Bjornsson “the national freak”. Bjornsson taught economics at the High School of Commerce and later at the Faculty of Business Administration and Economics at the University of Iceland from early 1940 until his retirement at 70 in 1982. He published many books, including a monumental work on the Icelandic economy. In 1956–1971, Bjornsson was a member of parliament for the Independence Party and contributed much to the great reduction of the economic controls in two steps, in 1950 and 1960. In 1978, he published a political tract, Libertarianism and Totalitariarism, which had great impact on the young generation in Iceland. Bjornsson passed away in 1999, leaving a wife and three sons. Gissurarson’s biography forms a part of the joint RNH-ACRE project on “Europe, Iceland, and the Future of Capitalism”. Top photo by m24instudio, vicmontol, tricky.